Yarabek, Margaret 4/1/1921 - 2/26/2017 Saginaw MI Margaret (Toma) Yarabek died Sunday February 26, 2017 at Cartwright Hospice House. She was born April 1st 1921 in Albee, MI. She was preceded in death by her husband Joseph on December 5, 1991 and daughter JoAnn Basserdett on April 16, 2012. Margaret was a member of Holy Spirit Catholic Church for most of her life. She loved to dance the polka and you could find her where ever a polka band was playing. 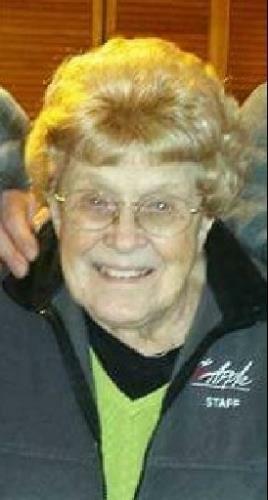 She also enjoyed playing cards and belonged to a card club with her 2 daughters and close friends. Surviving are 2 daughters: Jeanette (Gary) Baxter of St. Louis, MI and Joyce (Norm) Yockey of Saginaw, 1 son: Joseph J Yarabek of Lake Orion, MI. 12 Grandchildren and 23 Great Grandchildren. Cremation has taken place. Visitation will take place at 10am with a Memorial Mass to follow at Holy Spirit Catholic Church River Rd, Sheilds on March 4th at 11am. There will be a Luncheon to Follow at the church. In Lieu of Flowers the family wishes you to consider donations to St. Jude or The Cartwright Hospice House on Hospital Rd. in Saginaw.